Anti-euro sentiment in Italy is already very strong and about to get stronger. Eurointellihence has some interesting comments today regarding Italy. The demonstrations and protests [in Spain] are very likely now to spread to Italy. The country’s largest union, CGIL, said there would be a public-sector strike in September to oppose the Italian government latest austerity plan, Il Fatto Quotidiano reports. According to Susanna Camusso, CGIL head, its union will launch "a general strike of the public sector against the umpteenth measure." The cuts, to avert a 2% increase in VAT scheduled for September, include a 10% reduction of staff and 20% reduction of managers of public-sector. The complete package, result of the spending review conducted by Mario Monti, will save over €26bn until 2014. The measure, which will go before the Parliament at the end of July, was approved by the cabinet two weeks ago. In regards to factors that might lead to a eurozone exit, there are two major differences between Italy and Spain. Here is a pertinent chart. The net difference between those who think the euro is a good thing minus those who think it is a bad things is -4 percentage points in Spain, but -14 points in Italy. That is the biggest negative spread in the eurozone. The second difference between Italy and Spain is in regards to elections. Italian prime minister Mario Monti will be gone no later than general elections in 2013. In contrast, Spanish prime minister Mariano Rajoy is not scheduled to face general elections until 2015. Whether Rajoy's government can hang on that long is another question. In Italy, it is highly likely anti-euro candidates take over at least some of Italian parliament. A Time-Lapse Interactive Graph of the Popularity of an Anti-Euro Party shows just that. Please click on the link to learn about the rise of the "Five Star Movement". Recall that former Italian Prime Minister Silvio Berlusconi said "Italy should dump the euro unless the European Central Bank agreed to inject more cash into the economy". See Italy "Gasping Like Beached Whale"; Berlusconi Reiterates Euro Exit "Not Blasphemy"; Beppe Grillo Discusses "Taboo of the Euro"
The collapse of the Spanish bond market and the rise of protests in Spain are both very serious matters. There is every reason to believe those reactions will spread to Italy. 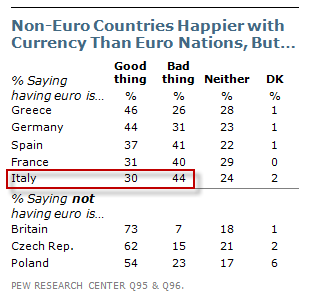 And with elections pending, the rise of anti-euro sentiment in Italy is extremely important. Monti may even be ousted before 2013 via failed vote-of-confidence. Every day that passes, the more strength the Five-Star Movement will gain. The irony is that it would be in the best interest of the eurocrats to hold elections now rather than later, before the anti-euro movement becomes politically unstoppable.